Meba Motor Protector Breaker MBVL-160 protection of electric circuit, motors, transformers and other equipments. 1. MBVL series MCCB is one of new products developed and manufactured by adopting international advanced technology. 2. It is supplied with rated insutaling voltage 690V and used for circuit of AC 50/60Hz, rated operating voltage AC 415V or below, rated opereating current from 16A to250A. 3. It is designed for protection of electric circuit, motors, transformers and other equipments. 4. 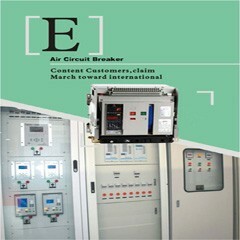 The products conforms to IEC60947-2 standard. Meba Motor Protector Breaker MBVL-160 is delevop moulded case circuit breaker used to distribute electric energy in distribution network, overload or short circuit protection power equipment and transformation of infrequent circuit under the normal conditions.